This is the second collection from a Brooklyn poet whose work many readers will know from the New Yorker. Jessica Greenbaum's narrative poems, in which objects and metaphor share highest honors, attempt revelation through close observation of the everyday. Written in "plain American that cats and dogs can read," as Marianne Moore phrased it, these contemporary lyrics bring forward the challenges of Wislawa Szymborska, the reportage of Yehuda Amichai, and the formal forays of Marilyn Hacker. The book asks at heart: how does life present itself to us, and how do we create value from our delights and losses? 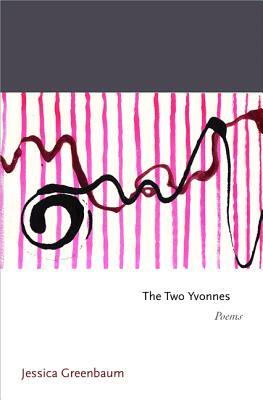 Riding on Kenneth Koch's instruction to "find one true feeling and hang on," The Two Yvonnes overtakes the present with candor, meditation, and the classic aspiration to shape lyric into a lasting force. Moving from 1960s Long Island, to 1980s Houston, to today's Brooklyn, the poems range in subject from the pages of the Talmud to a squirrel trapped in a kitchen. One tells the story of young lovers "warmed by the rays / Their pelvic bones sent over the horizon of their belts," while another describes the Bronx Zoo in winter, where the giraffes pad about "like nurses walking quietly / outside a sick room." Another poem defines the speaker via a "packing slip" of her parts--"brown eyes, brown hair, from hirsute tribes in Poland and Russia." The title poem, in which the speaker and friends stumble through a series of flawed memories about each other, unearths the human vulnerabilities that shape so much of the collection. She, too, had said, since sloughing off the world. Rough echoes of the risen sleeper, cold. Jessica Greenbaum is the author of the award-winning poetry collection Inventing Difficulty. Her poems and essays have appeared in the New Yorker, the Nation, Poetry, Southwest Review, and elsewhere. She is the poetry editor of upstreet.